A transformer is an electrical apparatus designed to convert alternating current from one voltage to another. It can be designed to “step up” or “step down” voltages and works on the magnetic induction principle. A transformer has no moving parts and is a completely static solid state device, which insures under normal conditions, a long and trouble-free life. It consists, in it’s simplest form, of two or more coils of insulated wire wound on a laminated steel core. When voltage is introduced to one coil, called the primary, it magnetizes the iron core. A voltage is then induced in the other coil, called the secondary or output coil. 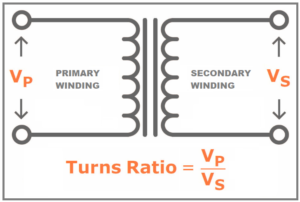 The change of voltage (or voltage ratio) between the primary and secondary depends on the turns ratio of the two coils. Transformer noise is caused by a phenomenon which causes a piece of magnetic sheet steel to extend itself when magnetized. When the magnetization is taken away, it goes back to its original condition. This phenomenon is scientifically referred to as magnetostriction. A transformer is magnetically excited by an alternating voltage and current so that it becomes extended and contracted twice during a full cycle of magnetization. The magnetization of any given point on the sheet varies, so the extension and contraction is not uniform. A transformer core is made from many sheets of special steel to reduce losses and moderate the ensuing heating effect. The extensions and contractions are taking place erratically all over a sheet and each sheet is behaving erratically with respect to its neighbor, so you can see what a moving, writhing construction it is when excited. These extensions are miniscule proportionally and therefore not normally visible to the naked eye. However, they are sufficient to cause a vibration, and consequently noise. Applying voltage to a transformer produces a magnetic flux, or magnetic lines of force in the core. The degree of flux determines the amount of magnetostriction and hence, the noise level. Why not reduce the noise in the core by reducing the amount of flux? Transformer voltages are fixed by system requirements. The ratio of these voltages to the number of turns in the winding determines the amount of magnetization. This ratio of voltage to turns is determined mainly for economical soundness. Therefore the amount of flux at the normal voltage is fixed. This also fixes the level of noise and vibration. Also, increasing (or decreasing) magnetization does not affect the magnetostriction equivalently. In technical terms the relationship is not linear. How can I reduce airborne noise? What are taps and when are they used? What is the difference between VPI and cast coil construction? VPI (Vacuum Pressure Impregnation) is a process that our transformer coils undergo in which a special polyester resin coating is applied in interchanging cycles of pressure and vacuum. The coils are then cured overnight in an oven at 350F. The VPI process includes pressure and vacuum. This process allows for better penetration of the varnish in the deepest crevices of the transformer coil. It also offers an increased resistance to corona, an electrical discharge brought on by the ionization of a fluid such as air surrounding a conductor that is electrically charged. Cast coil units are simply coils encapsulated in epoxy by a molding process while under vacuum. Although suitable for very harsh environments, they can sometimes be technically inferior to VPI. 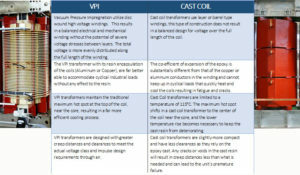 See below for brief comparison of VPI and Cast Coil. Cast is the common method in Europe and parts of Asia but the U.S. has become savvy to VPI and over the years has switched their preference to VPI. Experience shows that VPI transformers are not only equivalent but, in most cases they are superior to cast coil transformers. And here’s another fun fact, VPI is usually around 10-20 percent less expensive … not a bad selling point! Can transformers be operated at voltages other than nameplate voltages? What is Partial Discharge test and why it’s needed? Improper site and/or weather conditions with humid/dusty environments, poor or no maintenance procedures. Improper processing or drying of the insulation. Over-stressed insulation due to lack of proper recognition of the voltage limitation of the insulation. High stress areas on conducting parts which can be caused by sharp edges on either the conducting parts or ground plane. The effect of partial discharge in a transformer is twofold. One effect is that the ion and electron bombardment can be damaging to the insulation and shortens the life of the transformer. The other effect is the transient currents produced due to partial discharge may interfere with electrical communications. Partial discharge is defined as an optional test per IEEE C57.12.01.2015. MGM, for its own research and continual improvement performs this test periodically on a first design and or on prototypes. We also offer customer witness testing when specified at the time of order. MGM Transformer Company has been aware of the consequences of partial discharge in transformers for many years and has developed drying and processing procedures as well as insulation systems that virtually eliminates the presence of damaging partial discharges within our coils. The general procedure for partial discharge testing is to raise the voltage to 1.8 times the rated voltage and hold for a minimum of 30 seconds and then reduce the voltage to a level equivalent to 1.3 times and maintain it for 3 minutes and measure the partial discharge levels. The ambient levels of the instrumentation shall be considered when determining the final value of partial discharge. The maximum acceptable levels of partial discharge for resin-encapsulated windings is 50 pC (picoCoulumbs). Do your transformers contain PCB? All Dry-type and Liquid filled distribution transformers manufactured by MGM Transformer Company are PCB (polychlorinated biphenyl) free at the time of shipment. 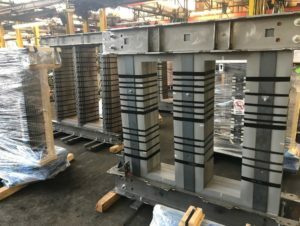 MGM is mainly known for its dry type transformers, but we also make liquid filled transformers and we can design and build with any fluid on the market. Dry type transformers are, you guessed it “dry”, so they are cooled by the air that passes through it. bottom of the tank is where the fluid is at its lowest temperature. The fluid flows up through the windings and is heated by the windings which in turn makes it rise to the top. At the top of the tank the fluid is at its hottest temperature and exits the tank to go through a series of radiators where it’s cooled and then flows back down to the bottom of the main tank. This process is continuous and can be aided by fans mounted on the radiators to cool the radiators at an even faster rate. There are several types of fluids offered but today’s feature is on the PCB filled transformers that are still floating around (no pun intended). Polychlorinated biphenyls (PCBs) were used as transformer oil, since they have high dielectric strength and are not flammable. Unfortunately, they are also toxic, bio-accumulative, not at all biodegradable, and difficult to dispose of safely. When burned, they form even more toxic products, such as chlorinated dioxins and chlorinated dibenzofurans. 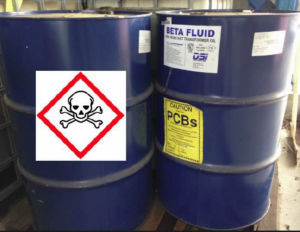 Mixtures of polychlorinated biphenyls (PCB’s) were manufactured commercially in the US until 1977 and used as transformers fluids because of their nonflammable nature and chemical stability. PCBs were widely used for about fifty years and produced under a variety of trade names, the most common of which were Askarel® and Pyranol®. Although chemically stable, PCBs would only slowly biodegrade. That is that they tended to persist in nature as opposed to decomposing into basic elements. There were numerous health studies conducted that documented their potential effects on both humans and wildlife. As a result, Congress passed the Toxic Substances Control Act. This act singled out PCB’s for regulation and directed the U.S. Environmental Protection Agency to implement controls. The majority of transformers were either disposed of under federal guidelines but there are still quite a few plants out there which still have PCB filled transformers. Changing out these PCB filled transformers requires a certain “know-how” which is right up our alley. We can match dimensions with existing units and even size up the kVA when doing so. If there are industrials in your area that may need changing out of PCB transformers you should contact us immediately. What is the difference between aluminum and copper conductor? So which is better? Copper or aluminum windings? Believe it or not, transformers wound with aluminum or copper wire have similar losses and performance. The choice of using copper or aluminum windings depends upon the application and the individual preferences of the person specifying the transformer. Aluminum’s perceived problem dates to the 1960’s when connection problems caused several fires. There were never any problems with the actual aluminum wire. 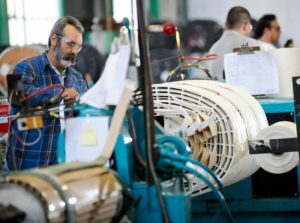 Modern, secure methods for connecting aluminum wire have been developed and are widely used. New methods of connections pierce the aluminum oxide layer in such a way that they remain gas tight to prevent further oxidation. The type of winding material does not affect the transformer’s reliability. A transformer’s life is defined by the life of its insulation system. Because aluminum-wound and copper-wound units run at equivalent operating temperatures, the insulation systems age at the same rate for each design. An advantage of aluminum windings is weight. Aluminum transformers weigh considerably less than copper transformers. This is important in high-rise office buildings with serious square foot weight limits per floor. Another advantage of aluminum wire is cost. Transformers wound with aluminum wire have considerably less cost than their copper equivalent with very similar performance. Improvements in technology regarding the use of aluminum in transformers have made aluminum-wound transformers the ideal choice for today’s applications. Here at MGM we can supply both windings with our transformers but most of the units we sell are aluminum-wound. Customers get the same performance with less cost so aluminum is a more common choice. Can MGM Transformers be reverse connected? NOTE: It’s always best to purchase a specially designed and manufactured step-up transformer instead of reverse feeding a step-down unit. Why do I need a bigger breaker when reverse feeding a transformer? 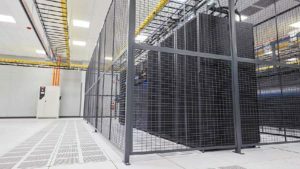 Today’s modern office buildings and manufacturing plants are dominated by non-linear loads; desktop computers, solid state ballasts, HID lighting, programmable controllers, and variable speed drives to name a few. Due to these electronic loads, significant harmonic currents have been added to the building’s distribution system. One result is the overheating of transformers causing premature failure. Until now, the only solution has been to de-rate a standard distribution transformer for application on these non-linear loads. De-rating is the operation of a device at less than its rated maximum capability in order to prolong its life. This is no longer acceptable in the industry. Underwriters Laboratories (UL) recognized the problems with de-rating transformers. As a result, new test procedures that coincided with ANSI C57.110- 1986 were established. Today, only those manufacturers that have their transformers evaluated by UL for harmonic loads can apply the label, “Suitable for Non-Sinusoidal Current Load with K-Factor not to exceed 4, 13, 20, 30, 40, or 50”. To de-rate a standard UL Listed distribution transformer would be a misapplication of that device. K-Factor is a measure of a transformer’s ability to withstand the heating effects of non-sinusoidal harmonic currents created by much of today’s electronic equipment. ANSI Standard C57.110-1986 addresses harmonic problems in transformers and the design solution. In this standard, the K-Factor is defined and its method of calculation shown. Once the K-Factor is determined, it is used in the design of the transformer to compensate for the additional heating effects generated by the harmonic currents. In short, K-factor is a weighting of the harmonic load currents according to their effects on transformer heating, as derived from ANSI/IEEE C57.110. A K-factor of 1.0 indicates a linear load (no harmonics). The higher the K-factor, the greater the harmonic heating effects. K-Factor ratings are different depending on the load. For example, incandescent lighting will require a K- 1, induction heating equipment: K-4 and mainframe computer loads: K-20. MGM is a leading manufacturer of Non -Sinusoidal Harmonic Transformers for Non Sinusoidal Harmonic loads. The MGM line carries the UL Listing for K -Factor applications from K-1 to K-30. 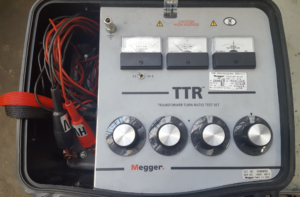 What is a TTR test? TTR stands for Transformer Turns Ratio. The function of a transformer is to transform power from one voltage level to another. The ratio test ensures that the transformer windings have the proper turns to produce the voltages required. For example a 480V primary to 240V secondary will have a ratio of 2:1 with a TTR value of 2. The Standards state that when rated voltage is applied to one winding of the transformer all the other rated voltages at no load shall be correct within one half of one percent of the nameplates readings. It also states that all tap voltages shall be correct to the nearest turn if the volts per turn exceed the one half of one percent of the desired voltage. The ratio test verifies that these conditions are met. The calculated ratios for a transformer with a rated primary phase voltage of 12470 with 2.5% taps above and below rated voltage and a rated secondary phase voltage of 480 are shown below. The ratio limits given permit a tolerance of one half of one percent from the rated voltage. Anyone who’s been around transformers knows the importance of electrical steel but for those of us that haven’t here’s a quick tutorial. Let’s start with the commonly used synonyms for electrical steel. This steel is often referred to as E-steel, silicon steel, transformer steel, grain oriented steel and or non-grain oriented steel. All of these are ways to express the specialty steel which the coils of a transformer sit on. It’s this very special steel which produces specific magnetic properties. Electrical steel is anywhere from two to four times the price of regular mild steel (aka carbon steel) and it’s because it’s comprised of very different contents. What’s important to note is the metallurgy of electrical steel. Electrical steel is about 5-6% silicon. Silicon increases electrical resistivity and lowers the core loss. Also, with electrical steel the presence of carbon, sulfur, oxygen and nitrogen must be kept very low since they would decrease the magnetic permeability. Carbon is especially bad since it can cause aging which would increase the power losses over time. If the steel is made without special processing to control the crystal orientation then it is called non-grain oriented steel (abbreviated as CRNGO…cold rolled non grain oriented steel). If the steel is processed in such a way that the optimal properties are developed in the rolling direction, due to a tight control of the crystal orientation relative to the sheet then it’s called grain oriented electrical steel (abbreviated as CRGO…cold rolled grain oriented). This is the much more expensive than CRNGO or NGO for short but the losses are far better. There are very few mills that make electrical steel and even fewer that make the good quality electrical steel which is needed to comply with the US efficiency standards. In fact, the United States only has one producer of electrical steel and that company is called AK Steel. There was a second a few years back (ATI) but they’ve since removed themselves from electrical steel altogether. The other good mills are in Japan (NIPPON AND JFE) Germany (THYSSEN) and China (BAO STEEL). There are a few other mills but they are not as widely accepted since they have larger than normal variances between batches. wound core, and unicore. Future “Did You Know” publications will go into each and the benefits associated to them. 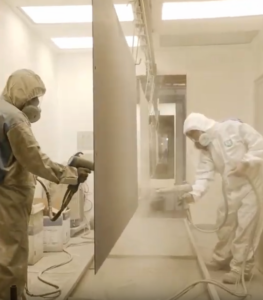 What is the powder coating paint system that MGM uses? MGM uses a powder coating paint process. Powder coating provides a long-lasting, economical and durable finish with a range of color options available for nearly any type of metal. In addition, a powder coated surface will be more resistant against scratches, chipping, wear, and fading compared to other type of finishes. MGM’s standard paint system utilizes TGIC Polyester powder coatings designed for exterior exposure and offers excellent weather resistance from a single coat finish, has good chemical resistance to splash/spillage, fumes and immersion in neutral, fresh and salt water. Standard color used on all dry-type and liquid-filled transformers is ANSI 61, a light gray color. We have two lines one for ANSI 61 and one for ANSI 49. In addition to the colors listed above, the factory can supply any RAL colors or if we are supplied with a sample paint chip of the color to match. For added protection with increased impact resistance and additional corrosion protection, MGM can offer an optional premium paint system. This system consists of a base coat of the epoxy coating, as described above, followed by additional coat of a high build polyurethane coating ( 5 MIL or 125 Microns). This polyurethane coating has excellent color, UV protection and gloss retention during extended service periods. The multiple coat premium paint system results in a high performance, corrosion resistant, system with excellent appearance and durability. Powder coatings contain no solvents and release little or no amount of Volatile Organic Compounds (VOC) into the atmosphere. Thus, there is no need for finishers to buy costly pollution control equipment. Companies can comply more easily and economically with the regulations of the S. Environmental Protection Agency. Powder coatings can produce much thicker/dense coatings than conventional liquid coatings without running or sagging. Powder coated items generally have fewer appearance differences than liquid coated items between horizontally coated surfaces and vertically coated surfaces. A wide range of specialty effects are easily accomplished using powder coatings that would be impossible to achieve with other coating processes. Curing time is significantly faster with powder coating than with liquid coating. Can a single phase transformer be used on a three phase source? No. Phase converters or phase shifting devices such as reactors and capacitors are required to convert single phase power to three phase. What is meant by regulation in a transformer? Temperature rise in a transformer is the average temperature of the windings and insulation above the existing ambient temperature. Insulation class was the original method used to distinguish insulating materials operating at different temperature levels. Letters were used for different designations. Letter classifications have been replaced by insulation system temperatures in degrees celsius. The system temperature is the maximum temperature at the hottest spot in the winding. Impedance is the current limiting characteristic of a transformer and is expressed in percentage. It is used for determining the interrupting capacity of a circuit breaker or fuse employed to protect the primary winding of a transformer. The impedance (or resistance to current flow) is important and used to calculate the maximum short circuit current which is needed for sizing, circuit breakers and fuses. This percentage represents the amount of normal rated primary voltage which must be applied to the transformer to produce full rated load current when the secondary winding is short circuited. The maximum short circuit current that can be obtained from the output of the transformer is limited by the impedance of the transformer and is determined by multiplying the reciprocal of the impedance times the full load current. High impedance transformers have a lower fault or short circuit current and have no need for high AIC rated breakers. However, they will have a higher voltage drop or regulation. Low Impedance transformers on the other hand have a lower voltage drop or regulation but have a higher fault or short circuit current and will need higher AIC rated breakers. Why is impedance given in a percentage? 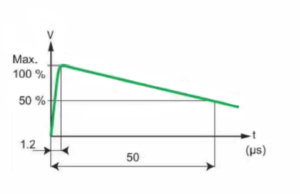 The percentage impedance of a transformer (Z%) is the voltage drop on full load due to the winding resistance and leakage reactance expressed as a percentage of the rated voltage. Electrical impedance of the load is expressed in ohms, and the relationship between the current and the voltage in the circuit is controlled by the impedance in the circuit. In general, impedance has a complex value, which means that loads generally have a resistance to the source that is in phase with a sinusoidal source signal and reactance that is out of phase with a sinusoidal source signal. The total impedance is the vector sum of the resistance and the reactance. The impedance is measured by shorting the low voltage terminals. With low voltage windings shorted, a voltage at the rated frequency is applied to the high voltage windings until full load current is circulated in low voltage windings. The ratio of voltage applied to circulate full load current to the primary voltage is the percentage impedance of the transformer. Thus a transformer with a primary rating of 110V which requires a voltage of 10V to circulate the rated current in the short-circuited secondary would have an impedance of 9%. Can single phase transformers be used on a three phase source? A transformer can’t act as a phase changing device and change single-phase into 3-phase or 3-phase into single phase. So a question frequently asked is: Can a single-phase transformer be used on a three phase source? The answer is YES! We all pretty much know that transformers are constructed as either singe phase or three phase. Voltage transformers, however, can be constructed for connection to not only one-phase or three-phase but for two-phases, six-phases and even elaborate combinations up to 24-phases for some DC rectification transformers. If we take 3 single-phase transformers and connect their primary windings to each other and their secondary windings to each other in a fixed configuration (either delta or wye), we can use the transformers on a three-phase supply. 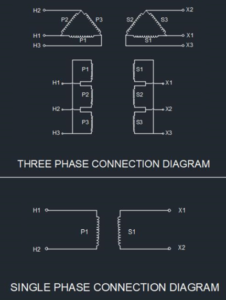 To make the transformer connections compatible with three-phase supplies we need to connect 3 single-phase transformers together in a particular way to form one Three Phase Transformer. A three phase transformer or 3φ transformer can be constructed either by connecting together 3 single-phase transformers, thereby forming a so-called three phase transformer bank or by using one pre-assembled and balanced three phase transformer which consists of three windings mounted onto one laminated core. The advantages of building a single three phase transformer is that for the same kVA rating it will be smaller, cheaper and lighter than three individual single phase transformers connected together because the copper and iron core are used more effectively. The methods of connecting the primary and secondary windings are the same, whether using just one Three Phase Transformer or three separate Single Phase Transformers. Does MGM provide “Zig-Zag” grounding transformers? What color are MGM dry type transformers? ASA 61 light gray is used on all enclosed transformers from .050 to 500 KVA. Other colors are available by request. Are MGM transformers U.L. listed? All of the transformers are listed by Underwriters Laboratories and have met their rigorous requirements. Is CSA certification available for MGM transformers? All MGM transformers are certified by the Canadian Standards Association. They have been designed and tested in accordance with the latest specifications. BIL is an abbreviation for Basic Insulation Level. Insulation levels in electrical equipment are characterized by the withstand voltages used during the impulse test. Impulse test is a dielectric test which consists of the application of a high frequency steep wave front voltage between windings and between windings and ground. The BIL of a transformer is a method used to specify the magnitude of the voltage surge that a transformer can tolerate without any damage to the windings and live parts of the transformer. When lightning impulse over voltage appears in the system, it is discharged through surge protecting device before the transformer gets damaged. BIL rating specifies the minimum voltage that transformer can withstand under this condition. The method of testing of the transformer for BIL has been defined and set by IEEE and ANSI standards. The wave shape has been also defined which is commonly known as 1.2/50 μs voltage wave. The impulse wave shape shows the magnitude of the voltage in KV (Kilo volts), Rise time (tf, time that takes the voltage rise from zero to its peak value in μs (Micro seconds)),and duration of the surge (T) sometime referred as Tail time (time that takes the voltage drop to 50% of its peak value in μs (Micro seconds). This test is done with the initial transformer design to validate the integrity of the insulation and its high frequency surge withstand capability. It is considered one of the design tests for any transformer and needs not to be repeated with every transformer manufactured. However, a quality control impulse test (QC impulse test or production impulse test) is offered as an optional test whenever required. Design impulse test consists of a reduced voltage, 2 chopped wave, and a full voltage impulse applied to the transformer. Voltage and current wave shapes are captured during the above tests for comparison. Any deviation from the reduced wave to full voltage wave shape should be studied. In general, they should be very close to each other. Any new bump in the full wave can be considered as a failure point. Based on the location of the bump, an educated guess can be made as where the failure has occurred. After subjecting the transformer to above voltage surge tests, transformer should pass hi pot test at 60Hz. and double induced voltage test 400 Hz. During quality control, impulse-only full voltage surge is applied to all of the bushings or the terminals of the transformer before hi pot and double induced test is performed. What is polarity, when associated with a transformer? How do I determine the required amp rating of breaker to be used on primaries? 1. Click calculator here, or on the main navigation bar on the left. 2. Input rated KVA and primary voltage of your transformer and click calculate. 3. Take the resulting amperage rating and multiply it by a minimum of 1.2 (recommended 1.4) do determine the amperage required. 4. Breakers are made in standard ratings, you should purchase a breaker rated equal to or higher than your requirements. When reverse feeding a transformer the breaker required will be larger due to reduced primary voltage. Follow the same procedure to determine your breaker requirements. NOTE: In case of discrepancy, provisions of NEC 450-3 and/or other local/national codes shall prevail over the above general guidelines. Can air cooled transformers be applied to motor loads? This is an excellent application for air cooled transformers. Even though the inrush or starting current is about 5 to 7 times normal running current, the resultant lower voltage caused by this momentary overloading is actually beneficial in that a cushioning effect on motor starting is the result. Can a three phase transformer be loaded as a single phase transformer? How many BTU’s of heat does a transformer generate? Do you have to ground a transformer? In most cases the enclosure of the transformer is grounded for safety reasons. However, a transformer will function properly without being grounded. Be sure to research all grounding requirements for your specific application against the NEC (National Electrical Code) as well as any local electrical codes.